The iBall Slide 3G 7271-HD70 is yet another dual SIM tablet with voice calling capability to have hit the Indian market for a budget-friendly price. It plays successor to the Slide 3G 7271 HD7 that went up for sale only in January this year. Both the gadgets carry price tags which read Rs 8,999, however, you can purchase the new device for a best buy rate of Rs 8,299. The very first thing that you will notice about the iBall Slide 3G 7271-HD70 is its screen which takes up most of the space on the front panel. This display measures 7 inches diagonally and can deliver visuals in a resolution of 1024 x 600 pixels. As it features SIM slots and a built-in earpiece receiver, interested users can easily make or answer calls using the slate. Apart from this, the iBall device also facilitates video conferencing, thanks to a front-facing VGA camera. And for all the other photography needs, customers can use a 2MP snapper with LED flash that resides on the back surface. Based on the Android Jelly Bean 4.2 OS, the 3G tablet acquires multitasking properties from a dual core Cortex A7 processor sprinting at a speed of 1.3GHz. On the memory front, you can expect an entire gigabyte of RAM and as much as 8GB of onboard storage for hoarding your content. The latter can further be increased by up to 32GB using a microSD card. Some of the other features of the slate include Bluetooth, GPS, FM radio and Wi-Fi amongst others and it draws power from a 3000mAh polymer battery. 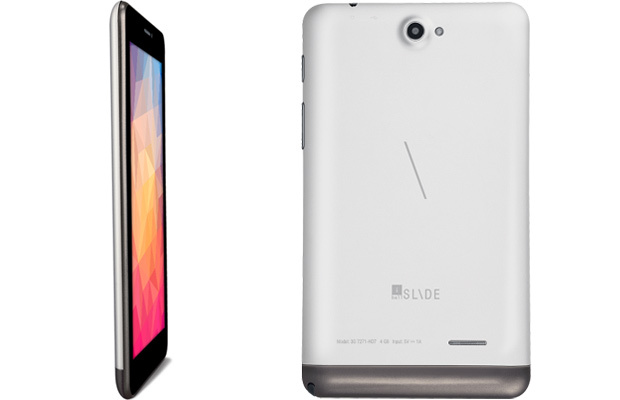 Like we said, the iBall Slide 3G 7271-HD70 will be made available for Rs 8,299 in India. You can visit the official site for more details.